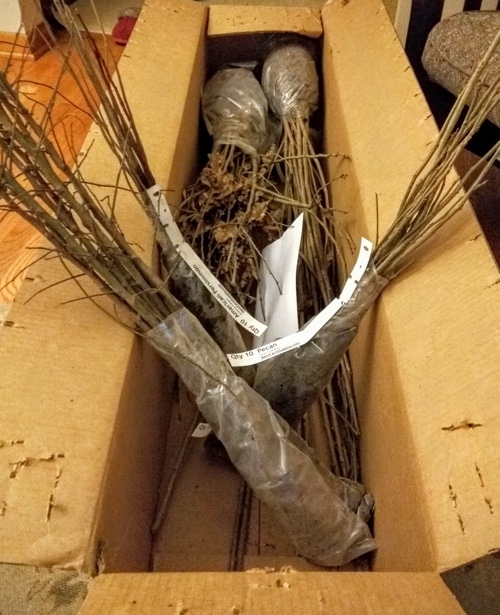 10 each: Anatovka apples, seedling (new, unnamed cultivars!) apples, pecan, chestnut, persimmon, pawpaw, redbud, and sweet cherry trees. Eighty trees. Oh, and they threw in a few extra just because they’re awesome like that. So did I go immediately plunge them in the ground? …No, I did not. I am not remotely ready for that yet. I’m still topping the hugel beds with the enormous mound of topsoil I had brought in. I’m not even completely settled on the final spacing. I’m going to tour a real, working food forest tomorrow night, which should give me a lot of insight. 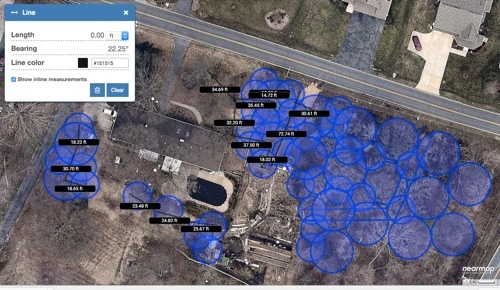 In the mean time I’ve discovered the fantastic nearmaps.com, which gives me a fantastically clear view and lets me do stuff like lay out circles of certain sizes, measure distances, etc. The biggest circles are the pecans and chestnuts, which have 40′ spans, and then the little 20′ circles all around their edges are the understory trees, apples and cherries etc. Sofía and I went out with little flags and a measuring tape and marked out the circumferences of all the circles. Now I have to take a step back and decide which of the existing trees need to get weeded out and replaced with new ones. I’m having a tree expert come help me decide some time this week and I am not looking forward to the permit process nor the final bill. 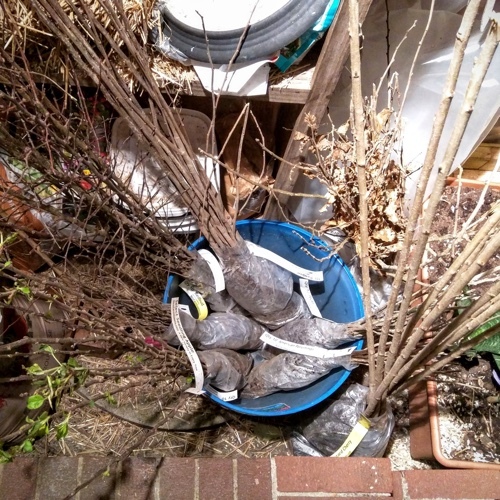 In the mean time I have all the dormant saplings heeled in in the cool, dark basement. They haven’t broken dormancy yet, but once they do I’ll have to pot them up. Hopefully I’ll have figured all this stuff out before I have to go find eighty pots! This entry was posted on Wednesday, April 20th, 2016 at 11:08 pm	and is filed under garden & farm, homesteading, permaculture. You can follow any responses to this entry through the RSS 2.0 feed. You can leave a response, or trackback from your own site. Atom, Entries (RSS .92), (RSS 2.0) and Comments (RSS 2.0). 26 queries. 0.267 seconds. Top.